From 29th July until 7th August 2016, art facilitators and gallery Castlefield (Manchester, UK) mounted an exhibition of screenprints, digital films, and wall-based text works by artist Amelia Crouch. In her printed annotations disrupting Lara Eggleton’s supporting writings, Crouch quite reasonably notes that “words often lie behind what I do” rather than acting as the primary medium which concerns her. Words attachment to, and parallel operations to, images, line and colour as constructive communicative tools are more important for her output. As is the way these infect, reinforce and contradict each other. Words may take shape in the drawn and written mark but shapes, forms, and their resonant ‘there-ness’ have a spatial presence which may influence words themselves. And visa versa. 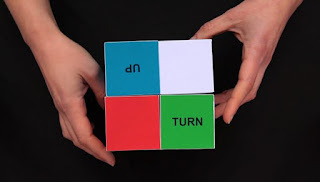 So, in the short silent digital video ‘Double Over’ (2013) hands manipulate an origami- box of a ‘magic cube”, a cube of hinged rectangles and shifting surfaces reminiscent of the paper folding games of children. Play with the shape allows abutting areas of information - words, colours, designs - to be changed into various limited but random sequences of information parodying mutable sentence structures. A similar point seems to be the aim of the ‘Untitled (Prepositions)’ (2015) digital video in which a woman in white articulates simple prepositions such as ‘over’, ‘on’ or ‘in’, whilst the actual position of an orange ball in a glass bowl of white balls changes. The validity of the spoken prepositions is necessarily questionably vague. The ‘Sensible Objects’ (2014) prints appear to lift linear illustrations of points of physical contact between the body and its outside.They have the attractive graphic formal clarity of an early Peter Saville design and the infantilizing simplicity of a corporate ‘mission’ statement. Unlike the digital projections, there’s no movement here, just inscribed solidity, any plasticity operates on an interpretative or conceptualizing level. As Eggleton’s text describes ‘...in her videos ‘Ifs & Butts’ and ‘Ayes & Knows’ (both 2013), double columns of tickertape words (if and but; yes and know) travel up and down the screen, intermittently becoming part of longer words as letters fade in and out.’ Highlighted in black the conjoined letters of the ‘tickertape’ words act like a genetic spine running through the scrolling parade of random words sandwiching them. Significantly, Crouch’s parred down ornamentation of bullishly bland text depends on repetitive vacuums of white, an orderly sequence of separations, to allow any chance of a mental purchase on her gnomic alphabet. A concern with the necessary vacuum between things - which allows an atomization and reconstruction of both images and words - is emphasised in Crouch’s latest work, ‘Attention Is Rarely Directed To The Space Between The Leaves’. The six minute digital video projection homes in on the whole and parts of trees, vegetation and plants; domestic and farmyard animals - all overdubbed with childish animal impersonations inappropriately allocated - and the illuminated spaces between these component bits. It’s not an entirely successful work but the fact that its inclusion doesn’t stop the entire show from working reasonably well is down to Crouch’s implicit acknowledgment that, whatever dismantling and toying undertaken with words, she will never reveal an essential core to their operations. Language in all its manifestations, only makes sense when its doing its job, and this necessarily means its job in the real, big, everyday world. So Crouch cannot avoid touching on memory as a parasitic dimension of half-truths, snagging tenaciously to our efforts to articulate nowness. Or an echo of spatially mobile lexicons of ‘signage’ in all their electronic and physical forms. Or the directive envelopes of institutional spaces. Or, probably most importantly, art and its own peculiar language obsessed dogmatic historical precedents.